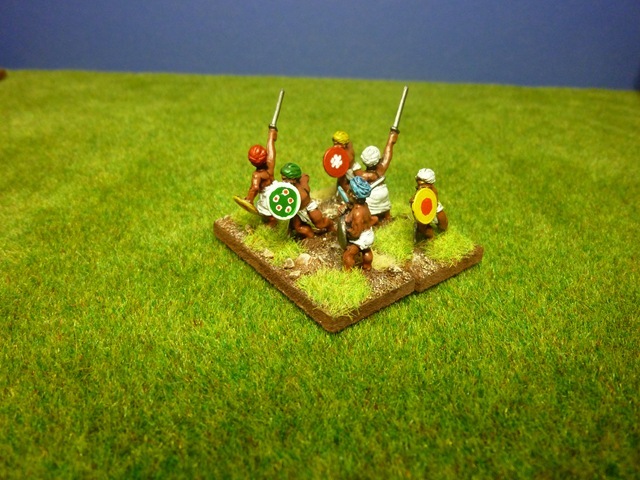 The first DBA army I put together and painted – yes, this was the first DBA army I got around to painting ever – was the Rajputs. This was the army that I did for Cancon 2011. I had left it to the last minute to prepare the army. I selected the Rajputs because there were not too many figures to paint and the colours, whilst bright, could be left unpatterned and bright thereby speeding the painting process as well. 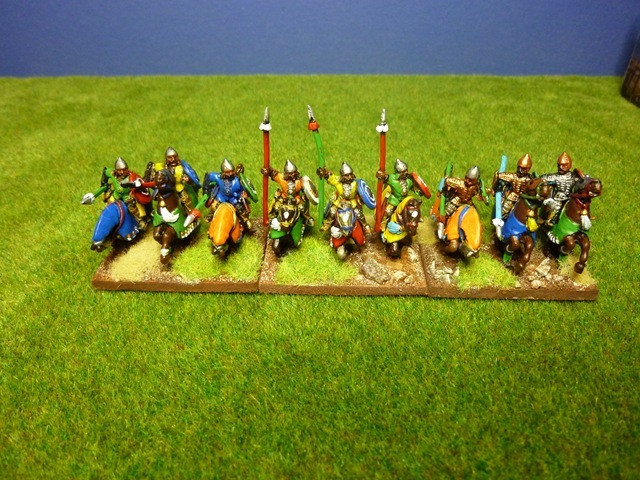 The result of a week of frantic painting and basing is shown above – the Rajputs for Cancon. Also shown is the camp I prepared in a hurry for the competition – using the picture of a large building from Rajasthan as the palace/camp. Rajputs consider themselves descendants of one of the major ruling warrior groups of the Hindu Kshatriya varna (social order) in the subcontinent, particularly North India. The first Rajput kingdoms date back to the 7th century CE but it was during the 9th to 11th centuries CE that the Rajputs rose to prominence. The four Agnivanshi clans rose to prominence first in this period and established territories and kingdoms. The organization of Rajput clans crystallized in this period. Intermarriage among the Rajput clans interlinked the various regions of India and Pakistan, facilitating the flow of trade and scholarship. Archaeological evidence and contemporary texts suggest that Indian society achieved significant prosperity during this era. The early 11th century saw the reign of King Bhoja, Paramara ruler of Malwa. The Battle of Rajasthan is a battle (or series of battles) where the Hindu Rajput clans defeated the Muslim Arab invaders in 738 CE. Whilst this is just before the period of this Rajput army, I tend to think that the Umayyad Caliphs were dealing with a Rajput force similar to the one described below. While all sources (Hindu and Muslim) agree on the broad outline of the conflict and the result, there is no detailed information on the actual battle or battles. There is also no indication of the exact places where these battles were fought. What is clear is that the final battle took place somewhere on the borders of modern Sindh-Rajasthan. Following their defeat the remnants of the Arab army fled to the other bank of the River Indus. This conflict involved the Umayyad Caliphs against the Rajput clans of Rajasthan on the Hindu side. The DBA Army list is given under the Hindu Indian list (list III/10) variation b – the Rajputs 747-1300 CE. Interestingly the rules call these as belonging in Tropical terrain where, let’s be honest, the part of India they were strong in could better be described as Dry or Cool. The general element – this is a choice within the army list. 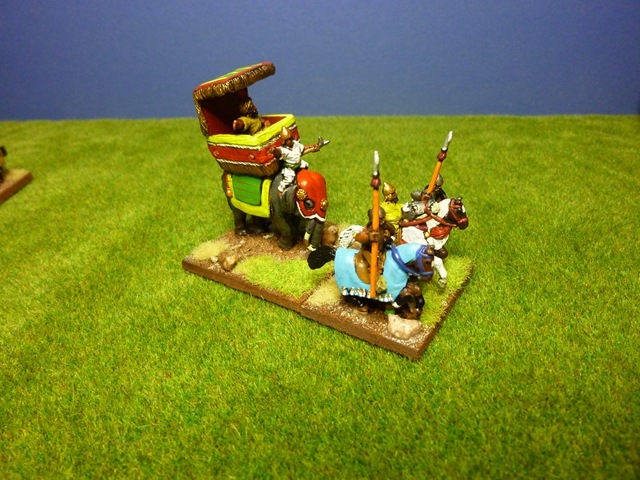 It can either be an elephant mounted general or a general mounted on horseback as an element of Knights. I used the elephant general and the mounted element three times each. The main mounted striking arm of the Rajputs are these three elements of Knights – over the DBA competition at Cancon these guys did a lot of the damage to the opposing armies although in the first game, they died in droves. Two elements of blades (3Bd) provide the main infantry strike force. Over the Cancon DBA competition these guys performed well, especially when working with the bows. Four elements of Bows (3Bw) give the army some distance shooting. Over the six games at Cancon, these guys managed not to actually shoot anything until the last game. They did, however, do well in melee a couple of times. Two bases of Psiloi (2Ps – light infantry) round out the army. These guys have protected the flanks of the army when there was bad terrain or slowed an opponents flank when that was needed. 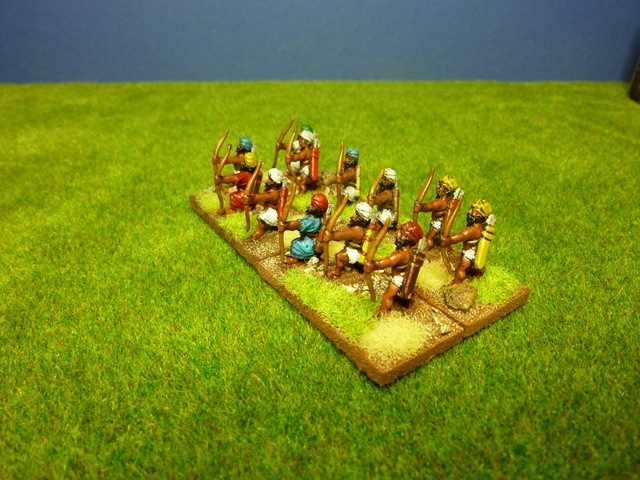 All the figures above are from the Essex Miniatures range and come in a standard 15mm DBA Army pack. 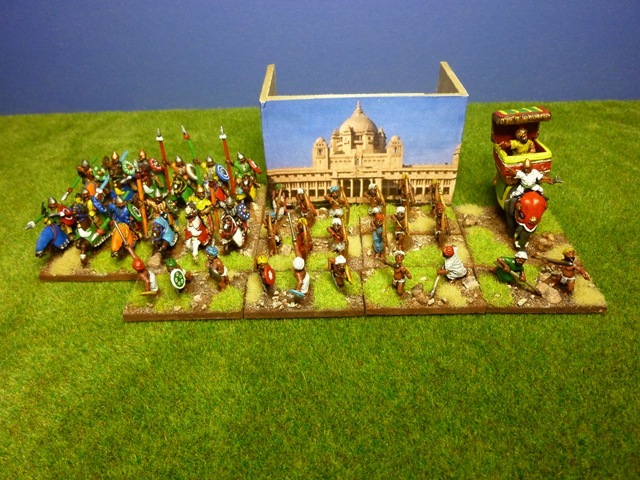 I think I also noticed that at one the Malaysian Wargamers DeBAKLe events – a DBA competition run each year in Kuala Lumpur – that a Rajput army has done very well there too. Thanks for going through your DBA army. I bought a NKE DBA army years ago and never painted it. When they release DBA2 I will paint it.